Document amendment & approval management is process through document are allow to modification and insert in current system on after approvals of authority. Document amendment & approval management is procedure / process that used or deployed in the system through all the management documentation are conducted for modification, alternation and inserting in the system for improvement, amendment that required for the management system, the current system improvement and managing internal documents used for the various processes in the management system to captured manufacturing processes, product quality and all the procedures are used in the company are managed and recorded through documents that important for the frequently reviews and verification of the improvement to covered all the part of the management and its requirements. All the amended documents are deployed or inserted in the system on after the approvals of the authority personnel, the authorized personnel are verify documents, conducting all the concern process with documents and on satisfaction they are approve document, approved all document are inserted in the system and remove all documents from internal system are used at various locations, and workplaces. 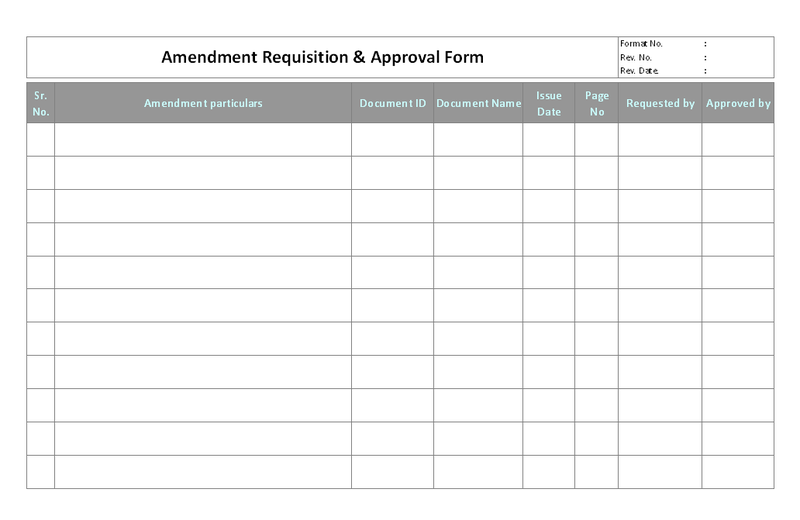 Amendment requisition & approval form is format for amendment of document, and this format is part of system thought document amendment request are send to department from concern user, on approval of department head on this format, department head is conduct this format and given to management representative for further amendment in internal system and deployment of revised format in system as end user expectation or approved for system requirements, same the management representative conducting requisition & approval form and manage internal system with revise.